The Shine cold press vertical juicer is compact, easy to use and produces healthy juice. Shine has incorporated the best features from Tribest's top selling juicers over the past 30 years and and put them in a simple vertical juicer that fits any countertop. 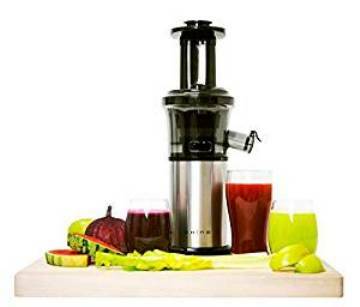 Powerful Cold Press - 200 W motor and low 40 RPM auger makes juicing healthy and efficient without jamming. Fits Anywhere - Compact footprint - 5.5" x 5.25" base diameter. Travel with this juicer. Juice Cap - Prevents a juice spillage. Keep all your juice in the pitcher or in your cup.. Simple & Sleek - Durable stainless steel body simplifies clean up and keeps your juicer looking good! From Anonymous of Rochester , New York on 3/9/2019 . I absolutely love this juicer. It is so easy to use, works great and easy clean up. I mainly juice celery and cut it up the night before to save time in the morning.